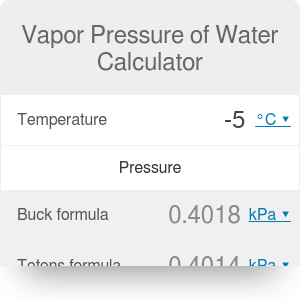 The vapor pressure of water calculator is a handy tool which can help in determining the vapor pressure of water and ice. Just type in the temperature and the pressure will appear in no time - don't hesitate, give it a go! If you're not sure what vapor pressure is, keep scrolling and you'll find the vapor pressure definition, five different vapor pressure formulas and details about most often used one - Antoine equation. Vapor pressure is one of the fluid characteristics: it's a measure of the tendency of a material to change into the gaseous/vapor state. The vapor pressure of a liquid can be measured in many ways, e.g. by a manometer connected to the flask with measured liquid. You may want to have a look at detailed explanation of vapor pressure definition and cool animations here. The higher the temperature is, the more molecules have enough energy to escape from the liquid or solid, which leads to higher vapor pressure values. At lower temperatures, fewer molecules have sufficient energy. For substances with stronger intermolecular forces, the vapor pressure will be relatively low. In contrary, for relatively weak forces the vapor pressure is relatively high. The important thing to mention is the fact that the surface area of liquid/solid substance in contact with the gas doesn't affect the vapor pressure. So it doesn't matter if we put our liquid into a wide flask or a thin graduated cylinder - the vapor pressure remains the same. simple_pressure = e^(20.386 - (5132 / (temperature + 273)), where vapor pressure is expressed in mmHg and temperature in kelvins. The temperature T is expressed in degrees Celsius and the vapor pressure P is in mmHg. Jump to the next section to read more about the constants in the Antoine formula. where T is expressed in °C and P in kPa. You can also use another equation, called the Goff-Gratch formula, but as it's more complicated (and approximately as accurate as Buck formula), we didn't implement it in our vapor pressure of water calculator. The table below shows the comparison of the accuracies between different formulas, for several temperatures from 0-100 °C range (32-212°F). The reference values come from Lide table with vapor pressure of water (all pressures given in kPa). As you can notice, the Antoine equation is reasonably accurate for higher temperatures, but the low ones are calculated with quite a big error. The Tetens equation works well for 0-50 °C range, but Buck beats all of them, for every checked value. For temperatures higher than 100 °C, the values start to differ significantly and the Antoine equation is usually the most accurate one. The Antoine equation is sometimes simplified (omitting C coefficient) or extended by three additional terms, what can increase the flexibility of the equation. The vapor pressure of water is the pressure at which water vapor is in thermodynamic equilibrium with its condensed state. If we raise the pressure and keep the temperature, the water will condense. Two formulas have a version for vapor pressure of water over ice (so for temperatures below 0 °C). Type negative temperatures into the calculator and vapor pressure will be determined according to Buck and Tetens formulas. Vapor Pressure of Water Calculator can be embedded on your website to enrich the content you wrote and make it easier for your visitors to understand your message.